Getting your samples quickly and safely to a laboratory for analysis is a key element of successful exploration. One or more Sample Batches can be grouped together into one Sample Shipment. Making sure your analytical results get back to you as soon as possible, and are stored in an organised way, is equally important. CampControl tracks and stores shipping details according to a Sample Shipment Identifier. CampControl tracks and stores analytical results using their Sample Batch Identifier. The CampControl "Samples" module simplifies these tasks, and makes record-keeping easy in an area notorious amongst geologists for avoidable delays, mix-ups and a lack of standardisation. The Sample Batch Identifier is normally created by the person who sends the samples to the laboratory. Typically, laboratories create their own Laboratory Identifiers which correspond to Sample Batch Identifiers, if they exist. If the submitter of the samples does not provide a Sample Batch Identifier, other means have to be used to match reported results to the sample batch - such as the date it was submitted, or the number of samples in the batch, or the sample identifiers of the samples in the lab report. This is an inefficient and error-prone way of linking laboratory reports with sample submissions. It is therefore highly recommended that Sample Batch Identifiers are used when submitting samples to laboratories. CampControl scans "results" emails received from analytical laboratories for Sample Batch Identifiers in order to know where to store the analytical reports. It is thus important that laboratories include the Sample Batch Identifier for the sample results they are reporting in the title or body of the email reporting the results. A comprehensive analysis of "Sample Custody and Results Receipt" activities is presented in the Activity Diagrams Appendix of this document. When examined in detail, these are clearly complex activities to track, which is why they can lead to so many costly errors in everyday exploration managment if not managed systematically, as in CampControl. 1: CampControl racks any number of transportation steps between sample source and destination lab. Only two steps are shown here: Camp to Expediter & Expediter to Laboratory. 5: Emailed Analysis Certificates are automatically attached to the correct sample shipment based on the Sample Batch Number. 2: Clicking on the red Freight Control Sheet (FCS) number brings up the freighting details. 6: Emailed analytical results files are also automatically attached to the correct sample shipment based on the Sample Batch Number. 3: Best practice requires that a copy of the Analysis Request Form is uploaded for permanent association with the sample shipment by the responsible geologist. 7: Emailed laboratory invoices are also automatically attached to the correct sample shipment based on the Sample Batch Number. 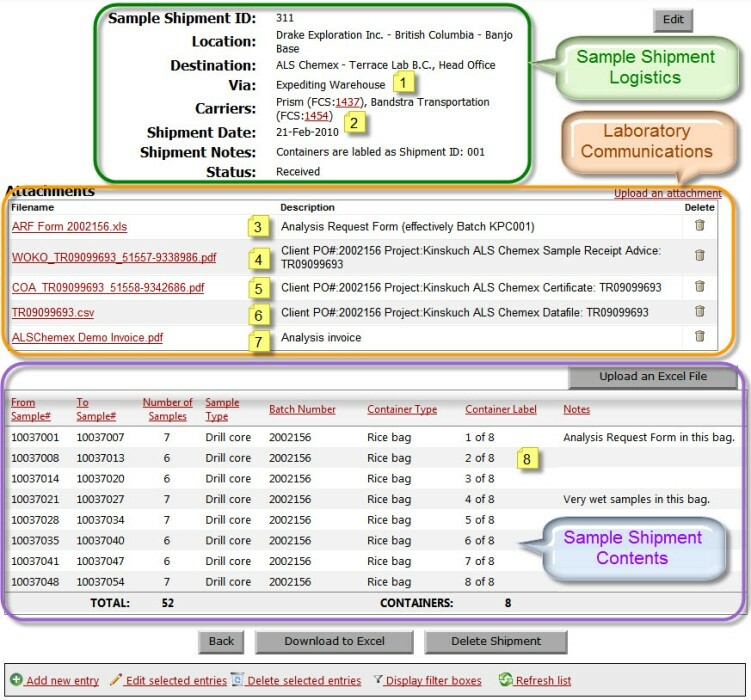 4: Sample Receipt acknowledgement emails sent out by the lab are automatically appended to the correct shipment based on the Sample Batch Number. (See also Note 12 below.) 8: The listing of sample numbers can be downloaded to Excel by the laboratory to avoid having to enter them again.